This Blueberry Cake recipe is fantastic. 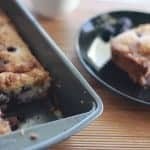 The cake is light and fluffy with the perfect amount of blueberries and a touch of sweetness with the brown sugar topping. Into my favourites pile it goes!